"Build your own system, base starts as keyboard tray only". Add single Mouse Keyboard Tray or Dual Mouse Keyboard platforms. 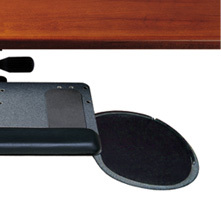 Dimensions: 19" W x 10-5/8" D.
By combining one of these platform options with one of our award-winning mechanisms, you will create the most non-intrusive, intuitively adjustable keyboard support available. Humanscale 900 Standard Keyboard Platform is made of phenolic, an ultra-strong, remarkably thin (1/4 inch) composite that is non-toxic, durable and easy to clean. 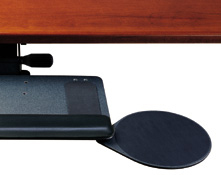 Standard 900 platform is designed to support nearly all standard keyboards and to fit most desks. Available with any of our mouse options. Dimensions: 19" W x 10-5/8" D.
Question: I have this product but need to replace the palm rest. Can I just order the palm rest? Answer: Yes, you can just order the palm rest. Question: If I purchase Humanscale 900 platform with 5GSM arm mechanism and 16" track, will the keyboard tray retract fully under my desk which is 18" deep? 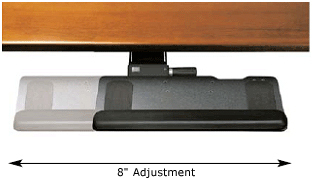 Answer: For the keyboard tray to retract fully under a desk, there needs to be 22” of space and 22” of track. With the space you have, the 16” track will allow your keyboard tray to retract under the desk, however it will not retract fully and the edge will stick out.